My boys are very particular about what they eat and how they eat it, leaning towards not wanting anything that is healthy for them i.e. veggies. Therefore, being the persistent Mum that I am, I am always devising some sort of cunning plan to get my children to eat what is good for them! This weekend’s attempt was baked potatoes with a twist. 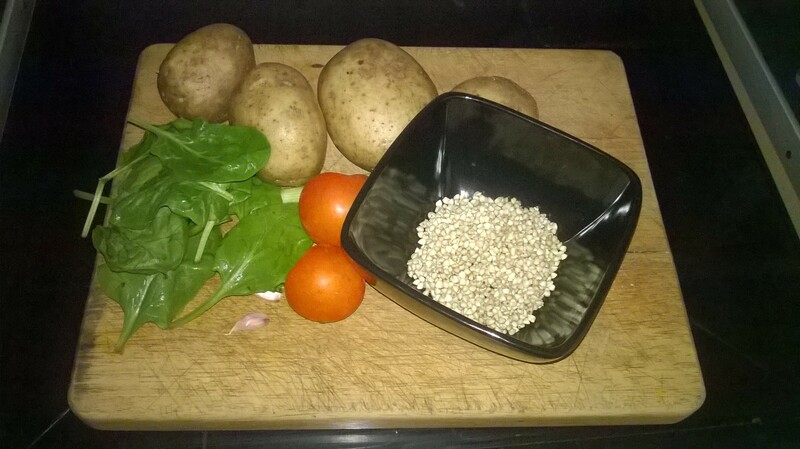 They love homemade chips, and will eat baked potatoes with no filling but honestly a baked potato alone for nutrition isn’t going to sit happily with me so I was mulling over just how could I get the veg in them…again! Ah ha creative moment, add buckwheat on top! They will eat anything if it has buckwheat in! Easy & Al absolutely love whole buckwheat and would happily eat it every day for breakfast. Add a baking tray to the oven. Prick the potatoes a few times and coat with oil and salt. Add the potatoes to the oven for 1-1 1/2 hours depending on the size. Turning half way and re-coating in the oil. Whilst the potatoes cook, gently steam the vegetables and blend them into a mash with the almond milk. When the potatoes are cooked, allow to cool slightly then slice off the tops and remove most of the insides being careful not to split the skin. Mash the potato and blended veg together with a fork and fill the potatoes with the mixture. Top with buckwheat and place back to cook in the oven for a further 10-15 minutes. Remove when the buckwheat is slightly roasted. Leave for about 15-20 minutes to cool and then serve. A must try – simple & scrumptious, shredded Kohl Rabi, Beetroot and Apple side salad. Wow! The taste is divine. It’s totally different to what I expected! For my first time eating a meal containing beetroot, this is now a must have regular side dish here in the kitchn. Betroot is yummy! Yummy yummy yummy! With absolutely no cooking involved and no need for sauces what could be more perfect for light summer food than this satisfying and taste bursting salad. 7. Intensely devour with extreme compassion for each mouthful. It’s a true taste of God. Try it yourself and see. Be brave, be bold and discover a new world within your reach.